What do you pack in your kid’s waste free lunch box? Another Lunch has an endless supply of ideas including this sweet idea with an edible nametag. And, check out Healthy Child Healthy World‘s zero-waste healthy lunch guide. Ohdeedoh spots a back-to-school-worthy Pinwale Alphabet set from Anthropologie. Kiwilog breaks down how to bake any recipe vegan-style minus, with the best bets for replacing eggs, butter and milk. Petit Eco Kids rounds up nature-inspired duds for babies and toddlers. 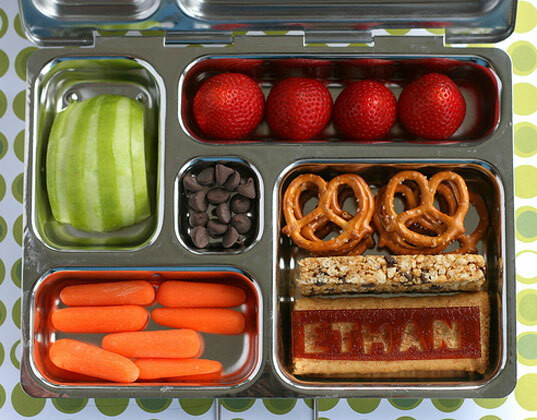 What do you pack in your kid's waste free lunch box? Another Lunch has an endless supply of ideas including this sweet idea with an edible nametag.